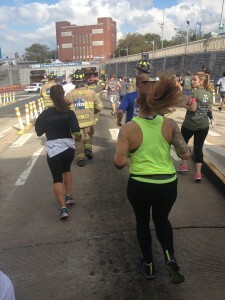 The Tunnel to Towers 5K Run & Walk is an annual event that honors our nation’s first responders and military heroes. Scheduled in September, the run comprises the route that firefighter Stephen Siller took on the eleventh, twelve years ago, when he heard a plane had struck one of the Twin Towers. Retrieving his gear from Squad One, Stephen ran through the Brooklyn Battery Tunnel all the way to the World Trade Center, where he would lose his life saving others. His was the course that 30,000 walkers and runners took this year into Manhattan, and Freedom Alliance joined the procession. 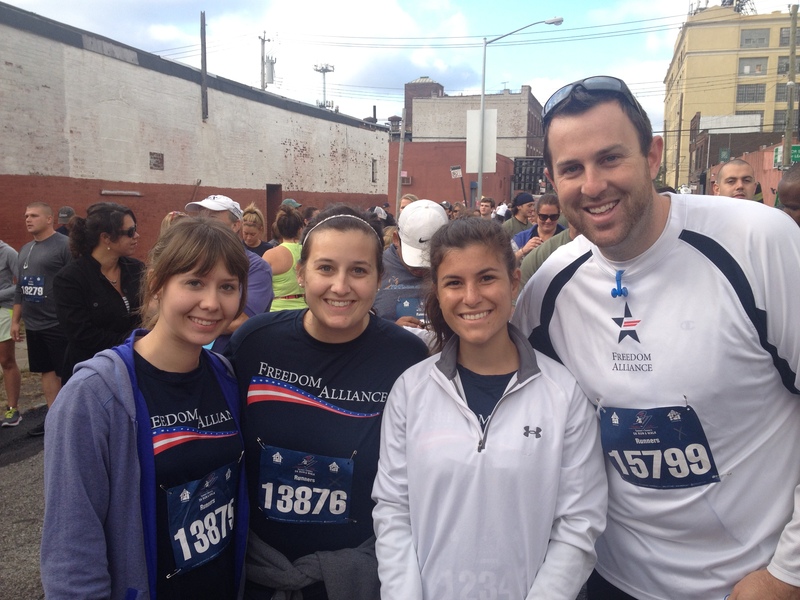 We took along with us three of our scholarship recipients: sisters Kalie and Breanna Walters and Megan Fester. This was their first opportunity to spend time in New York City, and home base for the weekend was the World Center Hotel, which overlooks the 9/11 Memorial reflecting pools and Freedom Tower. The young women spent Friday evening and Saturday exploring the city, including a My Kind of Town tour with Freedom Alliance friend and most excellent tour guide, James Smythe. Kalie, Breanna, and Megan spent an evening in Times Square, and James took them to significant sites all over Manhattan, including Chelsea Market and the Cathedral of St. John the Divine. Then it was up early Sunday morning for the trek to the race start in Brooklyn with tens of thousands of other runners—firefighters, civilians, and military service members from all over the country (and even some from other countries), including the West Point cadets. 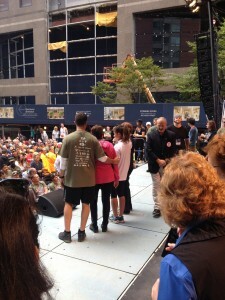 At the conclusion of the run, Megan was brought on stage to stand with former New York City mayor Rudy Giuliani, actor Steve Buscemi, several injured military heroes, and Stephen Siller’s family to accept the Siller Foundation’s Freedom Alliance Award. It was an emotional weekend, beginning with the fun of seeing this tenacious city for the first time and ending with a most poignant tribute to the country’s bravest, who daily sacrifice life and limb in the line of duty.